Businesses across Britain are losing £1,000 a year for every person they employ because of mental ill health among their staff, says a report published by the Sainsbury Centre for Mental Health. 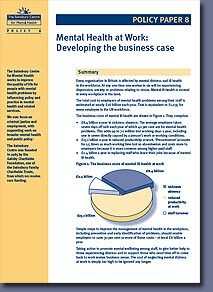 Mental Health at Work: Developing the Business Case, finds that the total cost to UK employers of mental ill health among their staff is more £25bn – that is equivalent to £1,000 per employee. some £15.1bn in reduced productivity among people still at work but unwell. Mental Health at Work finds that mental ill health is a normal feature of every workplace and less than one-fifth of it is directly associated with working conditions. According to the report, on any day, one worker in five will experience mental distress, and mental health problems account for 40% cent of sickness absence from work; however, the report also claims the cost of reduced productivity among people who go to work despite being unwell (so-called ‘presenteeism’) is greater still. "The costs of ignoring mental health at work are astronomical. A small organisation with 50 staff will lose around £50,000 a year. The NHS is estimated to be losing £1.3bn each year: equivalent to one quarter of its spending on mental health care. "Employers need to be aware of mental health. It affects every workplace in the UK. It is a normal part of the human condition. Yet most employers vastly under-estimate how many of their staff will have mental health problems. "Employers who take effective action to improve the wellbeing of their staff will reap the rewards for their efforts. They can take steps to reduce the risk of mental ill health among their staff. They can train and support line managers to respond quickly and effectively when staff do become unwell. And they can help staff who do need to take time off to get back to work when they are ready." However, the exact figures seem to be rather illusive as the website says: "Every organisation in Britain is affected by mental distress and ill health in the workforce. At any one time one worker in six will be experiencing depression, anxiety or problems relating to stress. The total cost to employers is estimated at nearly £26 billion each year. That is equivalent to £1,035 for every employee in the UK workforce. Simple steps to improve the management of mental health in the workplace should enable employers to save 30 per cent or more of these costs – at least £8 billion a year." That said, it is clear that once again what the trade unions and their union safetyr eps have been saying for years is suddentl being quoted by business as if it were something they had suddenly discovered - good health amongst the workforce is good for business!